Welcome to An Architect's Garden, in Pottersville, NJ. 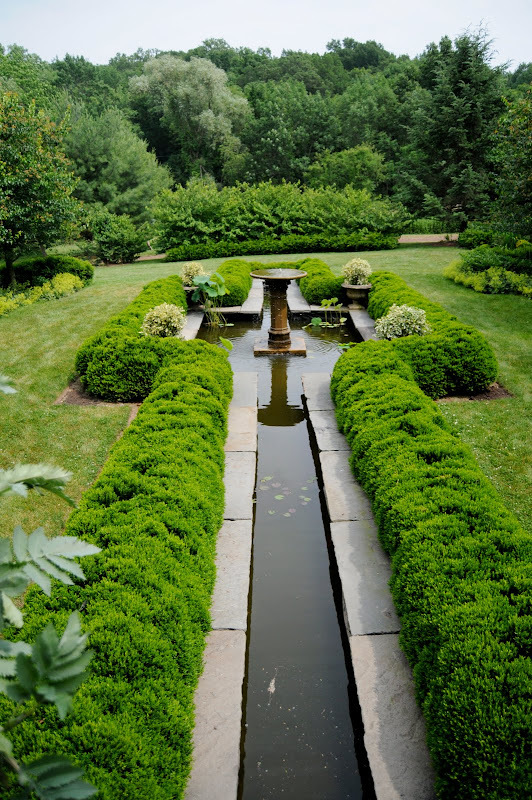 This is the second of two gardens we visited over the weekend, as part of The Garden Conservancy's Open Days program. 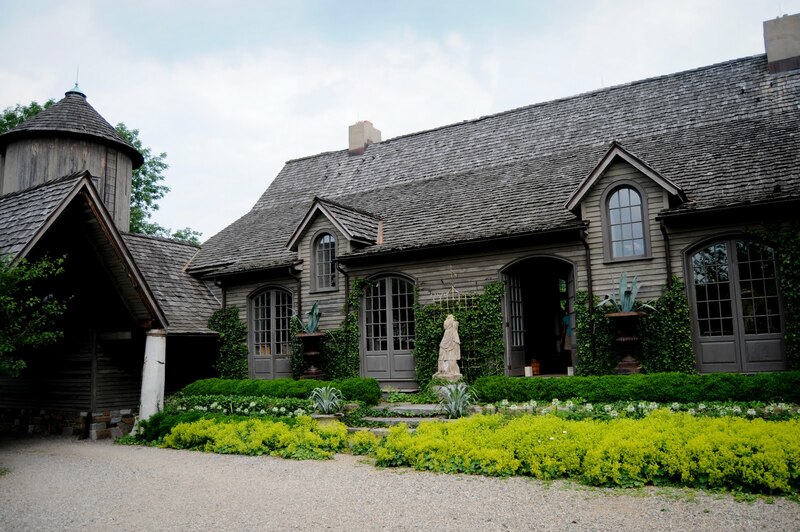 This stunning house and garden are part of an ongoing project begun in 1992. 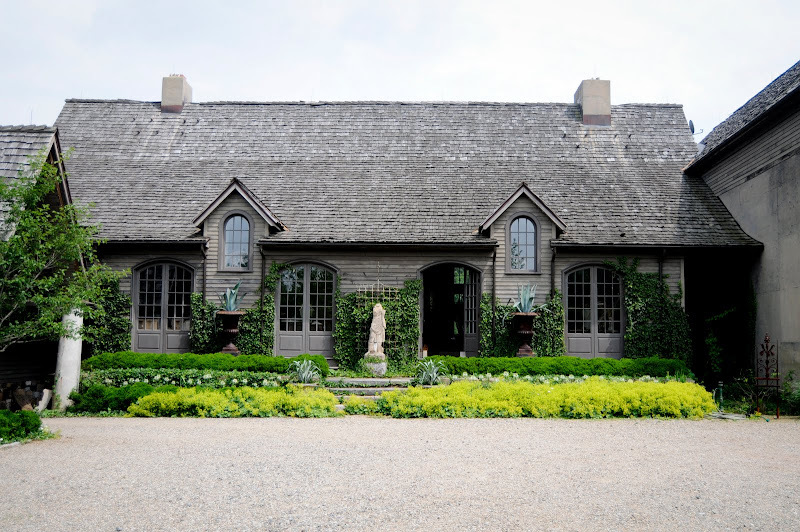 The owners bought an eighteenth-century dairy farm on 35 acres and turned it's four barns into a uniquely beautiful home filled with architectural salvage and antiques, and surrounded by several wonderful courtyard gardens in the European style. The west side of the house overlooks this fountain and water feature. 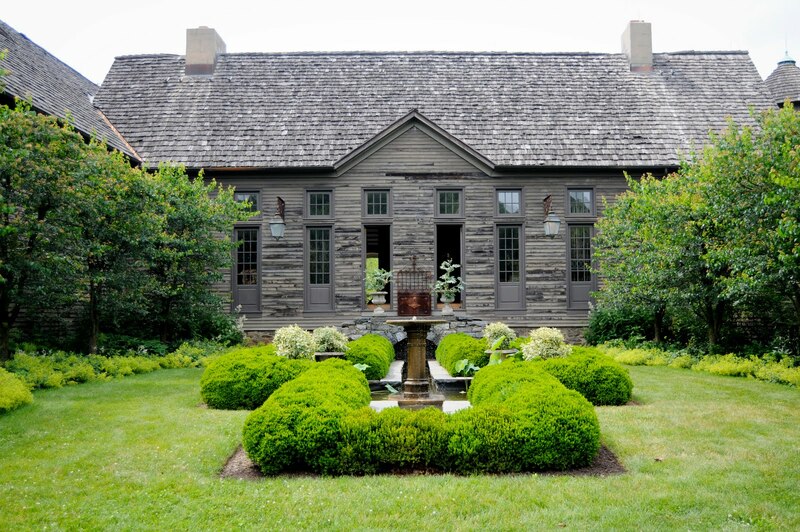 The owners belong to the American Boxwood Society, and the garden features many different types of boxwood which give it a beautiful architectural quality. Through the two open french doors of the house (above) is a great room that runs almost the entire length of the ground floor, with two gorgeous fireplaces at either end. 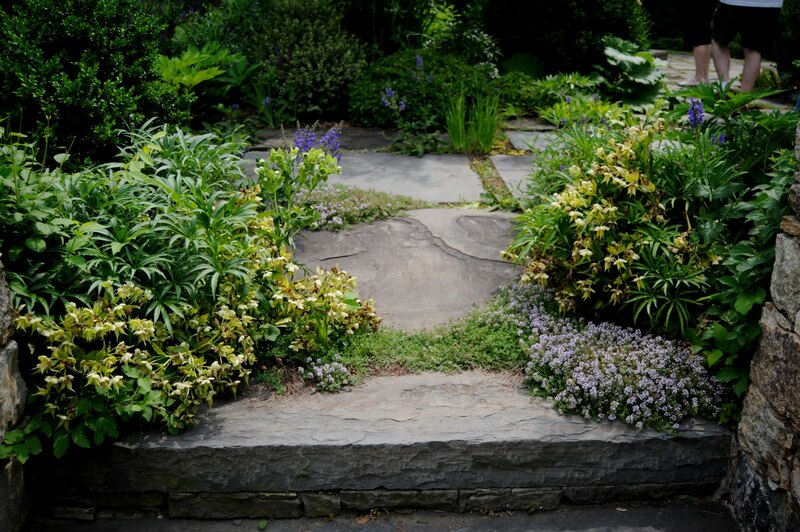 The steps up to the thyme garden (above) are beautiful with big clumps of hellebore on either side. 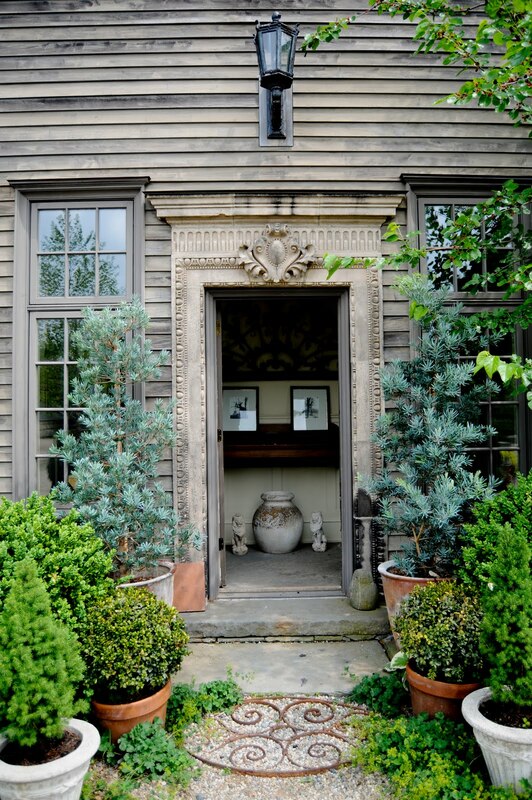 Salvaged architectural pieces are scattered throughout the house and garden, punctuating the ends of allees and leaning casually against the walls. 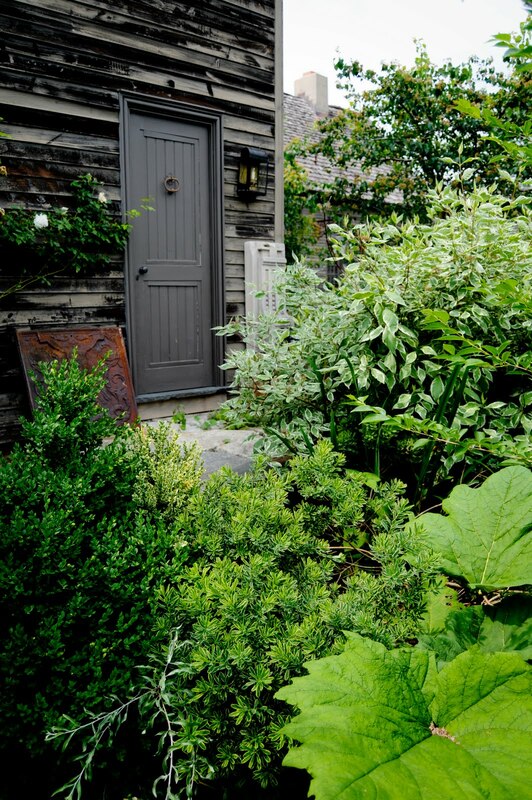 This is a view of the thyme garden looking toward the gravel courtyard outside the kitchen. Don't you love this beautiful olive jar (above)? I love the mixture of formal French boxwood garden and exuberant English plantings. Just look at those huge decorative leaves in the thyme garden (above). I'll share more of the garden and the house later in the week. In the meantime here is a link to the owner's website, Tendenze Design. Oh. My. Gosh. I love this place. I am so excited to see your photos of the inside. I have always loved barns, and making one into a home has been a minor dream of ours for years. I am always so curious about the interiors of these homes! If the inside is as beautiful as the outside it will be a real treat to see it. Thanks Mary! Lovely house and garden. Look forward to seeing the inside as well. My maiden name was Potter and I had relatives from that area. I wonder if the town was named for a Potter??? Beautiful pictures. I have always loved how gray compliments the color of just about every plant. Oh my. This is stunning! So very, very different from my surroundings. Thank you for posting such beautiful pictures. Can't wait to see the inside. Wonderful photographs of a lovely building and garden. We are lucky in the UK to visit lots of properties similar to that either privately owned or owned by the National Trust or English Heritage. Looking forward to seeing the photographs of the interior later in the week! Jackie. What an absolutely stunning home and gardens! Your pics are so beautiful; makes me want to go see it, now. I can't wait to see more of this lovely place. What a treat to be able to go through such lovely gardens and to be able to see inside too! I can't wait. Oh, that is awesome, thanks for taking us along! Great how they have mixed formal with country and it works beautifully! Love all the different elements! What a beautiful place. Love the buildings-- and their color. Thats just GORGEOUS. I could pack my bags and move right in there. Cant wait to see the inside. That just totally takes my breath away. Oh my goodness, WOW! are the eloquent words that come to mind. David Hicks, a brilliant British interior designer and gardener from the '60s and on, noted that interior and exterior design should flow, one to the other. Both should complement and enhance each other. Well, this fella's got that idea down pat, doesn't he. Mary, I got a new camera, yesterday, for my birthday. Your photos are always inspirational! Not fair as I always come in and look at your blog. I would love to live in that house. Is this a public tour? 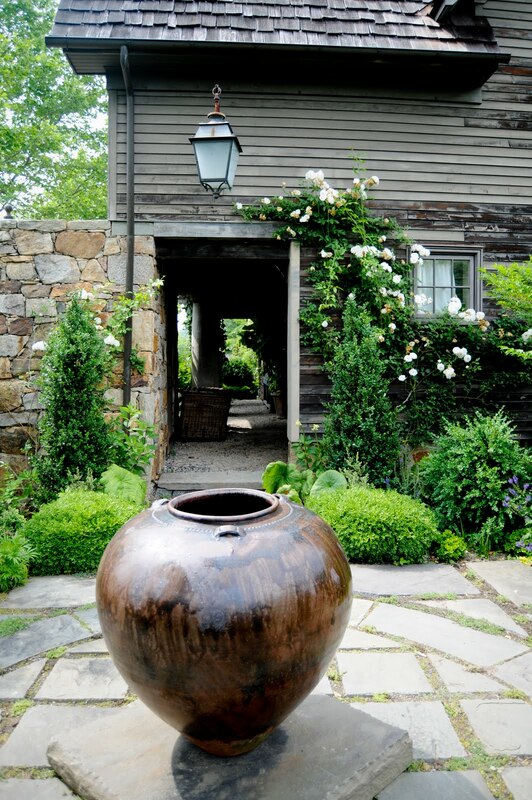 What a fabulous garden and yes I just love the large olive jar. Would make a wonderful focal point in any garden. Thanks for sharing the part of tour with us, can't wait for the rest. WOW... this is absolutely amazing! I always love visiting your blog. This garden...it's lovely and dreamy! Thanks so much for sharing! Wow. These people have done their homework on combing form and testure to create fabulous garden beds. I think it is so nice of homeowners to open up their gardens and houses to share their labour of love.....and to give the rest of us ideas! I look forward to the inside of this place Mary. Very Beautiful. 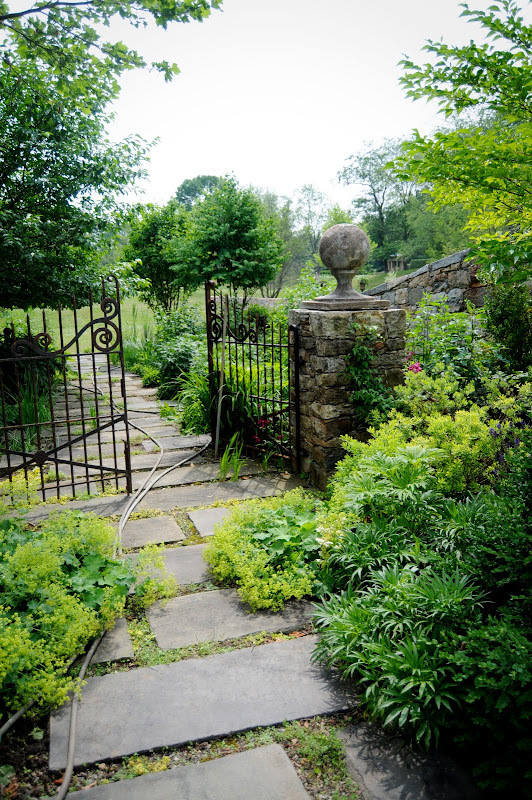 A walk around your garden could get you into a very nice frame of mind! Now for a minute I thought you and your camera had stumbled into our yard ... HA! That is a stunning combination of house and garden. I think I LOVE that house -- love the grays against the greens. Beautiful! 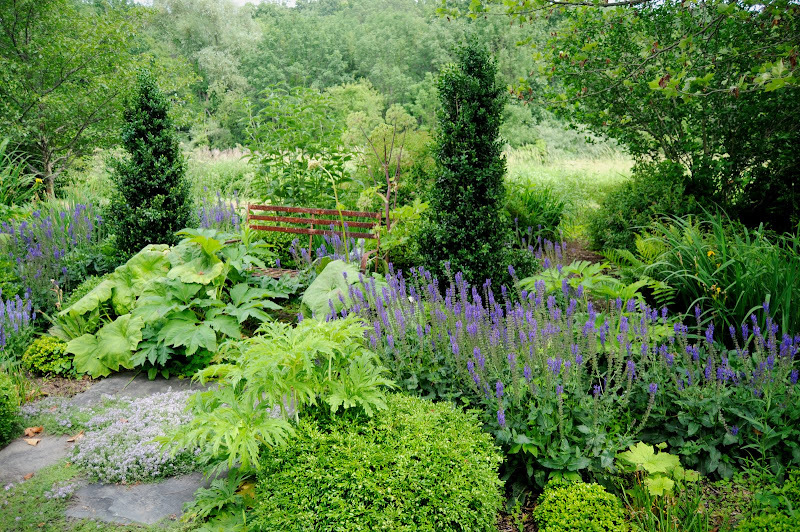 Wow, what stunning gardens. So full of character with tranquil walks. Beautiful & Brilliant! Gorgeous home and beautiful gardens. I love to attend the home and garden tours. This is the house that I want to live in!